PALO ALTO, Calif., September 27, 2017 — Rubrik today announced the 4.1 release of its Cloud Data Management platform. Rubrik Alta 4.1 completes support for all major cloud providers with a new Google Cloud Platform integration. The release also broadens support for Amazon Web Services (AWS) and Microsoft Azure, making it easier than ever for companies, governments and nonprofits to keep and use their data anytime, anywhere. According to IDC, virtually all new application deployments will be made in a cloud-oriented architecture within the next two years and 47 percent of all organizations plan to purchase a copy data management solution in that timeframe. 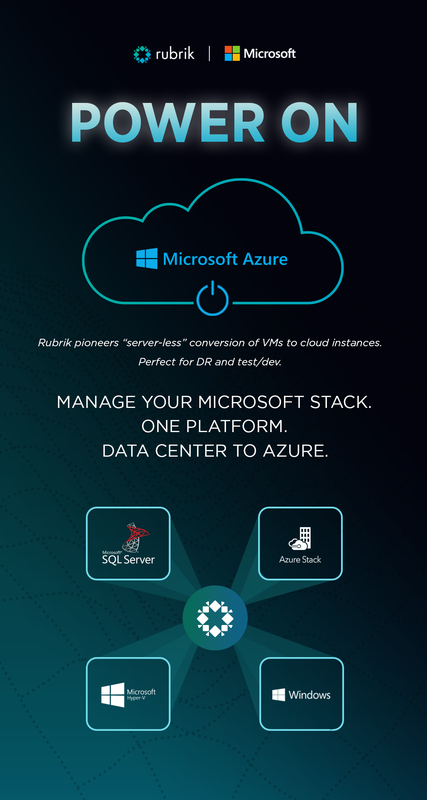 Rubrik can be deployed to orchestrate all critical data management functions – backup and recovery, replication and DR, archival, search, and analytics – for all Microsoft apps; Windows, Hyper-V, SQL, Azure, and Azure Stack. Rubrik Cloud Data Management was architected from the beginning to deliver cloud archival and data services. With Alta 4.1, Rubrik CloudOn instantiation services support both AWS and Microsoft Azure, providing “server-less” conversion of VMs to cloud instances. Now enterprises can use Rubrik CloudOn services to power-on applications in Azure, mobilizing them from data center to cloud. This lowers the costs of disaster recovery and test/development in the public cloud by utilizing cloud services only when needed. Rubrik is one of the first data management vendors to announce support for Microsoft’s new private cloud offering, Azure Stack. With Rubrik, users can easily migrate applications from Azure Stack to Azure and accelerate test/development of on-premises and cloud applications. Rubrik has always been available in the private, hybrid or public cloud. Rubrik Alta 4.1 adds cloud archival support for all classes of Google Cloud Storage (Nearline, Coldline, Multi-Regional, and Regional). Enterprises can now orchestrate application data across a multi-cloud environment for long-term retention while retaining instant data accessibility through search. Rubrik’s platform enables federal government agencies and commercial contractors to securely manage data from creation to expiration across private and public clouds with end-to-end encryption. Rubrik supports Microsoft Azure’s GovCloud and AWS GovCloud, and is an Advanced Tier Technology partner in the AWS Partner Network (APN). Rubrik Alta 4.1 broadens support to all government infrastructure offerings from AWS, including advanced secure services like Commercial Cloud Services (C2S). Rubrik 4.1 also adds support for Amazon Glacier, completing support for all storage classes of AWS – Amazon Simple Storage Service (Amazon S3), Standard-Infrequent Access (Standard IA), and Amazon Glacier. Customers can now automate data archival to Amazon Glacier to fulfill legal and compliance requirements. With 4.1, it only takes one click to enable the Amazon Glacier Vault Lock policy for Write-Once-Read-Many (WORM) locked archive on AWS for strict regulatory and compliance controls. Rubrik bolsters management security for multi-tenant organizations—such as Service Delivery Partners and large enterprises delivering IT-as-service — by adding secure, exclusive access to data management services in a hybrid cloud environment. With Rubrik 4.1, administrators can assign granular permissions to managed objects (e.g., assign Oracle DBs to Oracle Admin) to accelerate the self-service delivery of protection policies, recoveries, and analytics reporting across a multi-cloud environment.